Prayer flags date back thousands of years to the Bon tradition of pre-Buddhist Tibet. Bon shaman made and hung prayer flags in five colours representing the five elements – earth, air, water, fire, and space. According to Eastern medicine, health and harmony are produced through the balance of these five elements. It was thought that properly arranged coloured flags around a sick patient harmonized the elements in his body, helping to produce a state of physical and mental health. The flags were also used to help appease the local gods and spirits of the mountains, valleys, lakes and streams as protection against natural disasters and disease. As Buddhism spread from India during the first millennium AD it incorporated some of the earlier Bon traditions. 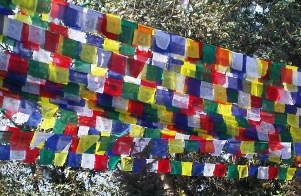 Sacred mantras and iconographies were painted onto the Bon flags, thus creating the beginnings of what have now become known as Tibetan prayer flags. Originally the writing and images on prayer flags were hand-painted. When in the 15th century carved woodblocks were introduced from China, it became possible to reproduce identical prints of the same design. Traditional designs could then be easily passed down through the generations. Tibetan prayer flags are known as ‘Lungta’ among Tibetans which translates as ‘Windhorse’. The most common flags have the Ghachenchemon mantra script contents on them. The literal translation of this is the ‘highest umbrella’ which gives the protection of enlightened prayer to its followers. The mantra invokes the wish that all sentient beings should have a rich life of achievement, free of fear, pain, misery, ignorance, illness, and failure. Usually the Windhorse image is at the centre of a set of five flags, often with four supernatural and symbolic creatures at each corner: the dragon, the Garuda, the snow lion and the tiger. The Windhorse gallops like the wind carrying the wish fulfilling jewel which radiates peace, prosperity and harmony. The Windhorse symbolises the accomplishment of positive work by the elimination of all hindrances. Other flags may carry images of auspicious symbols, protectors and enlightened beings. Prayer flags may be hung either inside a building for good luck and to increase the spiritual atmosphere, or outdoors where the wind can carry their prayers and beneficent vibrations across the countryside. Traditionally prayer flags are hung from the highest points, such as eaves and trees, or fastened to wooden poles for vertical display. 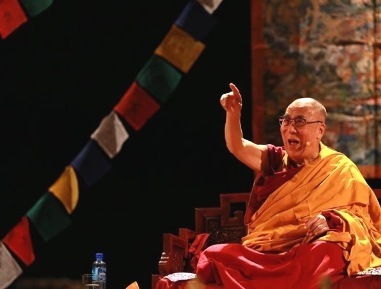 The photograph below shows the Dalai Lama speaking in Oslo. Windhorse Imports supplied the prayer flags (Medium Fine Cotton). Due to the rising cost of cotton, many prayer flags today are made of polyester. Although cheaper these are generally inferior in quality and in colour. 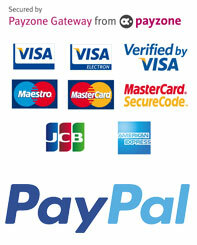 Windhorse Imports is one of the few suppliers still offering genuine fine cotton flags.